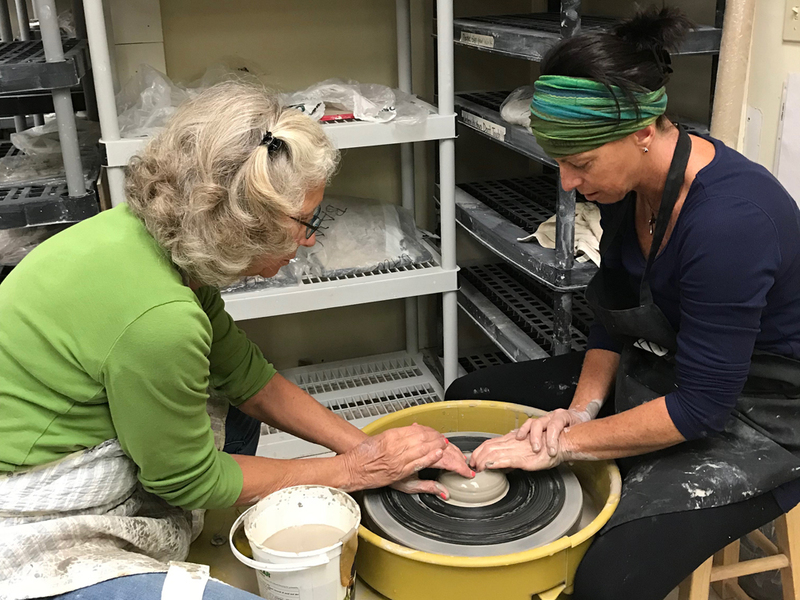 • Wednesdays, 9:30 a.m. – 12:30 p.m.
• Wednesdays, 1 – 4 p.m.
We may also practice using trimming tools on leather hard pieces and learn to use slip glazes to add color to greenware. In addition to class time, additional studio time is available to students for working on their pieces. Each class is limited to four students. Due to this small number, we are not offering online registration. Please call the gallery at 910.575.5999 for availability and to sign up. This is such a fun class. I have had a blast. Rita is a fantastic, patient, calm teacher. She has many years of experience and shares her knowledge and new ideas with her students. Pottery is now my new life passion! Thank you for the feedback, Sherry! We love having Rita in the Sunset River family! And you, too!